Lanning at Large… up with the cup! THE end of the rainbow is 19in. high, 10in. wide, and weighs 175 oz. Today it is within my grasp and for a magical, mind-boggling moment I’m the envy of every man and boy in England, Wales — aye, and a few in Scotland, too—who has ever kicked a football. 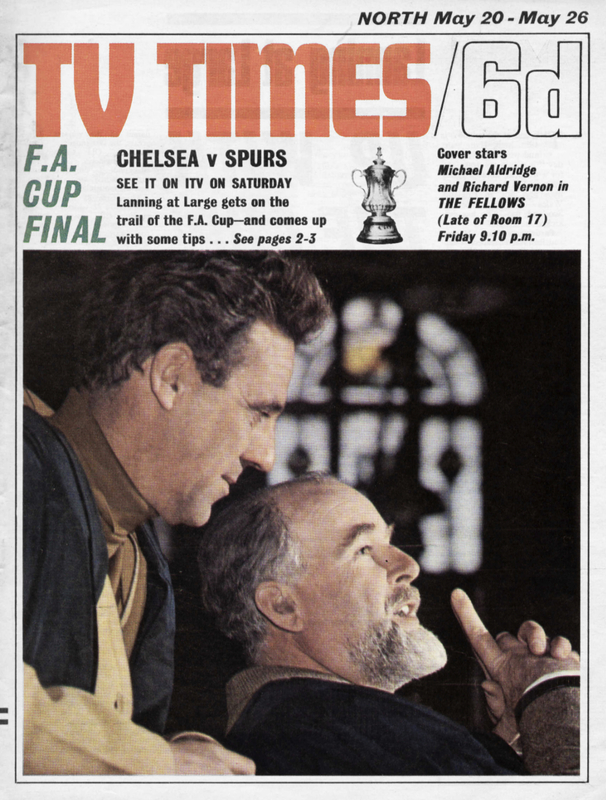 Particularly Dave Mackay and Ron Harris, respective captains of Tottenham Hotspurs and Chelsea. All year they’ve been hoping they will end up just like this. Triumphantly holding the FA Cup. On Saturday at Wembley Stadium, and before a television audience of millions, 22 of Britain’s greatest club players will summon every sinew to share such a moment. Since this soccer season started, from the minnows to the mighty, 400 clubs, more than 4,000 players, have been chasing this particular rainbow. Since the 1871-72 season (when the first F.A. Cup competition was staged) thousands of players — the great names, the immortal names, the forgotten names — have been in the chase. Since 1911 (when this particular trophy was introduced) the winning of the F.A. Cup has been the ultimate in soccer endeavour. Mind, I haven’t had such a gruelling, heart-stopping time getting within holding distance of the Cup as the winning skipper will on Saturday. But it’s been quite a performance get ting this far. WHERE am I? Mustn’t say. WHO is in charge of the Cup? Must remain anonymous. WHERE is it stored before going to Wembley? Oh, that’s awfully hush-hush; nobody is even sure yet what route it is going to take there. This is strictly an undercover assignment. Top secret. No names. Wouldn’t have got within miles of the F.A. Cup if I hadn’t taken the oath of secrecy. I’m at… well, an address in London. Somewhere in sprawling, densely-populated London. A poker-faced, uniformed commissionaire views me suspiciously and requests means of identification. Makes a short, terse telephone call. I hear footsteps. Half expect to see James Bond’s Doctor No emerge, but instead it’s a middle-aged man in a grey suit, who leads me silently up winding, red-carpeted stairs. No, there isn’t a blindfold — I must look an honest type. With memories of passing through the Russian Customs with Hughie Green, I pass into a plush conference room, with heavy blue curtains shielding the light and any inquisitive eyes. Big-time soccer is understandably jumpy about its silverware since the theft of the World Cup, virtually on the eve of the big event last year. Still there’s no sign of the Cup. But I should worry. Players and fans have been up for it since the mutton-chop whisker days of nearly a century ago. Few have got this far. Only three men in Britain know exactly where the Cup is after the February 1 deadline date — when winning clubs must return it to the Football Association — until the Final. No official is permitted to be photographed with the Cup. Some shady type might recognise him and trace the Cup through him. Apart from when it is cleaned (by a highly reputable firm), it is never out of the sight of two young, anonymous “guards”. Ssshh. I think they’re bringing it in now. The whole Cup is packed in a large, black box in wads of tissue paper. It emerges in three parts — lid, Cup and plinth. The “guards” piece it together without speaking, as though it is the rarest of china. And there it is… a most magnificent bauble. It is the little things that strike you. Like the knob on the lid. Practically a small replica of the Cup itself. And the depth and size of the inside of the trophy. Magnums of champagne have ended up in here and I reckon it would need a gallon to fill it. The off-beat stories of the years come drifting back… in 1955 Newcastle’s jubilant players, about to swig the celebratory champers, found a set of false teeth in the bottom. In 1964 West Ham startled soccer by drinking milk from the Cup. Now that seems sacrilege. It’s a champagne or nothing trophy. On the plinth, the inscribed names of the winners. The greats, the disbandeds… Old Etonians, Old Carthusians, Royal Engineers, Aston Villa, Blackpool… they’re all here, fading slightly, but carved into soccer immortality. There are 85 names here (since 1871-72 season, but excluding 10 seasons when Cup fighting was abandoned for wartime fighting) and they’re fast running out of space. Another silver strip will be added at the very base of the plinth in a year or two which should take us through to about 2000. Lift the Cup… gently now. It’s heavy — nearly 11 lb. Perhaps that’s an unexpected reason why winning teams pass it around on their victory lap of Wembley — it gets to be quite a weight for one man to carry for a whole lap, particularly after 90 minutes of flat-out football. This is the third Football Association Challenge Cup. The first one was stolen in Birmingham in 1895, while Aston Villa were the holders, and the Villa still have rather red faces at the memory. The second was withdrawn in 1910, after it was found to have been duplicated several times in design. It is probably the best-known trophy in the world… yet it is insured for £300! Only £300? Just ask any member of Spurs or Chelsea Or any soccer fan worth the name in these islands. It’s the Crown Jewels, all the stars in the skies and Killamey, rolled into one. Utterly priceless. That’s about £75 by current market price. And Mr. Richard Came, partner in charge of silver at Sotheby’s, reckons the auction value of such a trophy — forgetting its sentimental value — would be about £250. Scrap silver? Auction the Cup? Perish the thought! This is the end of the rainbow. IT’S all very well for us. We’ll have our feet up. a comfortable chair, and a cup of tea at half-time. Saturday’s F.A. Cup Final will be an exciting, but congenial experience for us, thanks to ITV. Spare a thought for the personalities whose Cup Final won’t be nearly so relaxed. For whom split-second liming, quick thinking, and sheer hard work spell out Cup Final ’67 — the ITV Wembley team. How do they view Saturday’s great occasion? And how do they see the first all-Cockney Final this century ending up? While we will be watching, mainly, one thing — the ball — Billy Wright, ITV’s soccer expert, will be casting a cool eye on other things. Sweat on shirts, socks rolled down. Lines on faces. Players breathing heavily. These, then, are the tell-tale signs that Billy Wright — winning skipper at Wembley in 1949 with Wolves and a man who has played on Wembley’s lush turf around 80 times — will look for on Saturday. Eamonn Andrews, ITV’s anchor man, faces an afternoon of thrills… and frustration. Based at Wembley, he’ll see parts of the game, then must dash back to his desk to bring viewers up to date with the general sporting scene, for ITV have a full sporting programme, including wrestling and racing from Lingfield. If Eamonn seems agitated don’t worry. He tipped Tottenham for the Cup back in the Third Round in December in World of Sport — and had a 10 bob bet on them at 100-7! Score: 3-2, with Jimmy Greaves getting the winner. For Hugh Johns, ITV’s commentator, this is his first F.A. Cup Final behind the mike. He will be on parade again next week. On Wednesday, he does the commentary when England meets Spain at Wembley. Hugh, who did a fine job for ITV on the World Cup Final, lives in Wales, and naturally, he will be watching the big-name Welsh players in the Final — Tottenham’s Mike England and Cliff Jones (if he plays). And while we’re talking about tips, my colleague Maurice Woodruff this year picks Chelsea to win by 2-1 or 3-1. “Spurs to start well, but drop away,” he says.